Pixar, what started off as a simple graphics company unknown to the world soon became part of one of, if not, the most successful companies around the world, Disney. Today I’ll be looking for the best of the movies released. And keep in mind, this list will only focus on movies made specifically from Pixar, not including movies made by Disney, so no need to worry about Frozen ending up in the dishonorable mentions. Yes, a tie for the first two Toy Story movies, I didn’t enjoy the third so… Woody, a good-hearted cowboy doll who belongs to a young boy named Andy sees his position as Andy’s favorite toy jeopardized when his parent buys him a Buzz Lightyear action figure. Even worse, the arrogant Buzz thinks he’s a real spaceman on a mission to return to his home planet. And when Andy’s family moves, the two toys end up in the hands of the misbehaving Sid Phillips, a kid who likes to torture and kill toys where they have to escape before Andy moves without them. Toy Story 2 is about Andy’s family having a garage sale and Woody ends up getting stolen by a toy collector who then takes him to his apartment where he finds out he was part of a popular show called “Woody’s Roundup” and meets fellow cast toys Jessie, a cowgirl, Bullseye, a horse, and some prospector man that I don’t like enough to look up his name. Woody gets used to the concept of staying with them until Buzz and the other toys come rescue him where they all go back and become Andy’s toys, well all except the prospector who is found by a girl who decorates him to be a fat Barbie doll. Myself, along with half the population of the world, love these movies and consider them a classic, but the reason why they are the lowest slot on the list is because the way Sid put a decapitated doll’s head on a robotic spider scared me when I was younger and made me develop an irrational fear of baby dolls (thanks Pixar), and I like the other movies on this list more than I like Toy Story. Anyone else just feel an intense hunger every time this movie is on? Ratatouille is about Remy, a resident of Paris who appreciates good food and has quite a sophisticated palate. He would love to become a chef, so he can create and enjoy culinary masterpieces to his heart’s delight. The only problem is Remy is a rat. When he winds up in the sewer beneath one of Paris’ finest restaurants, the rodent gourmet finds himself ideally placed to realize his dream. I can’t really explain why I like this movie that much to be honest. The story seems to be one of the most far-fetched of all Pixar, and the animation is great but it’s aged at this point. Yet, I still really enjoy watching this movie and I strongly suggest if you haven’t yet, give this one a watch. One of the saddest movies made for kids; however, it’s still one of the absolute best Pixar movies of all time. WALL-E, short for Waste Allocation Load Lifter Earth-class, is the last robot left on Earth. He spends his days tidying up the planet, one piece of garbage at a time. But during 700 years, WALL-E has developed a personality, and he’s more than a little lonely. Then he spots EVE, a sleek and shapely probe sent back to Earth on a scanning mission. Smitten, WALL-E embarks on his greatest adventure yet when he follows EVE across the galaxy. If it weren’t for nostalgia and a few other reasons, this would be my absolute favorite Pixar movie from everything from its animation to how they’re able to convince the audience that two robots can develop a love for each other even though neither of them was even designed to have a consciousness. Lots of people criticized how all the humans were bland and the message to conserve the environment was over the top, but the main movie’s focus isn’t about that. It’s about two robots’ love for each other. And, I know I keep saying this for every movie, but the animation is just worth a mention. Unlike most Pixar movies, WALL-E seems to focus more on the realistic aspect of the animation rather than making it look colorful and cartoonish, and don’t get me wrong that’s a good type of animation and I really like movies that do that, but something about seeing stuff that looks real enough that you’re able to confuse from reality, just makes me think how hard the animators worked to render the world as realistically as possible. If you haven’t gone to give this a watch, I strongly suggest that you do, but keep in mind, the movie is about a dystopian future of Earth being polluted so badly all the humans had to evacuate it for hundreds of years before it actually can be inhabited again… So not really the cheeriest movie there is. Coco, the newest and one of the best additions to Pixar. Despite his family’s generations-old ban on music, young Miguel dreams of becoming an accomplished musician like his idol Ernesto de la Cruz. Desperate to prove his talent, Miguel finds himself in the stunning and colorful Land of the Dead. After meeting a charming trickster named Héctor, the two new friends embark on an extraordinary journey to unlock the real story behind Miguel’s family history. The plot followed up by the most visually pleasing visual animations I have seen from a Pixar so far makes this one of the best movies of Pixar and can even be argued one of the best movies ever. 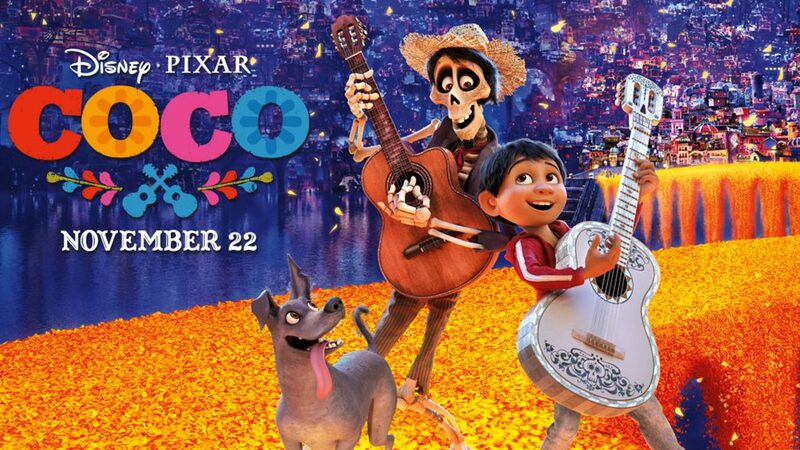 I’ll admit, I was skeptical when I was going to see this since the similarities to The Book of Life, but I am glad I actually went to see this masterpiece of a movie. It has such a good ending. I actually shed a couple tears and I never actually cried at a movie before this, heck, not even WALL-E got me anywhere near feeling sad, and I just really love how a movie is actually able to convey emotions so well the audience feels them. There really aren’t many flaws in this movie. The only part I didn’t really like about it was the beginning since it was pretty slow at times, and the only other stuff is nit-picky like Miguel can be a bit cringy from time to time but really nothing too bad. It’s a really solid movie. If you haven’t seen this yet, I strongly suggest you do because it’s such a good movie. This movie is so great. In fact, you can say it’s the most incredible of all of the movies ever produced by Pixar. The plot is about married superheroes Mr. Incredible and Elastigirl who are forced to assume mundane lives as Bob and Helen Parr after all super-powered activities have been banned by the government. While Mr. Incredible loves his wife and kids, he longs to return to a life of adventure, and he gets a chance when summoned to an island to battle an out-of-control robot. Soon Mr. Incredible is in trouble, and it’s up to his family to save him. This movie is the best for a few reasons. One, it shows an original story, I don’t know a single movie that was made before The Incredibles that was about what happens after heroes retire. Two, though it’s not like Coco’s visuals, the animation is very good. Pixar went so far just to make this movie to be as realistic as it possibly could be. For a movie about superheroes, anyway, Pixar actually went far enough to painstakingly animate Violet’s long hair for months just to make it react like real hair does, which actually helped create many more long-haired characters in future animations. And the final reason this is the absolute best movie ever is how relateable this movie is. If you take away all their superpowers, they would pretty much just be a typical family just trying to get through the day, and I just love that about this movie and I just can’t wait until the sequel on June 15th. This is a good list but I don’t agree 100% on it. I think Moana should definitely be number 1. I admire your reasoning for the order of your movies. I agree the incredibles was a great movie, i cant wait to read more of your stories. I really like all these movies but i feel like some should have been changed.